Synergetics is an isokenetic stretching/resistance exercise system that puts no impact or stress on any part of your body. Every whole-body motion is done standing comfortably upright in one spot, shifting your weight from one foot to the other. You use only the built-in strength of your hands and upper body to gently pull or push your torso to its natural range of motion as you exercise all of your muscles at the same time. 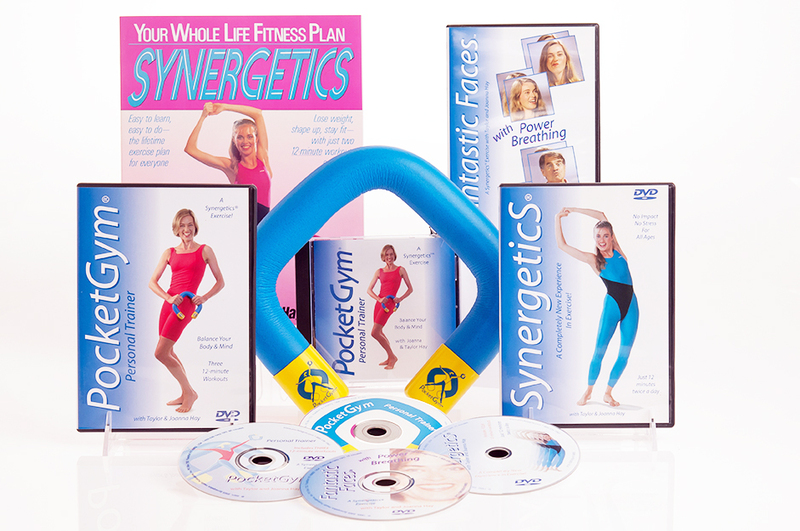 A PocketGym, PocketGym DVD and PocketGym CD (digital download) the Synergetics DVD, the Fantastic Faces DVD and a Digital Download of the original Synergetics book. Streaming videos are optional. A PocketGym, the PocketGym DVD with three 12-min. workouts, plus a 77-min. CD that has three 12-min. audio workouts and many valuable tips (CD is a digital download). The PocketGym Kit is also in The Works. Streaming videos are an add-on option. Streaming Video-on-Demand 8 Synergetics - PocketGym Workouts PLUS we will ship you your hand-held PocketGym.